I actually enjoyed playing the first game... but as with all games I play the "squirrel!" syndrome eventually took over and "ooh, shiny!" came along. The second just felt too restricting. Granted, I didn't get very far, but when you give me an open world game and then don't let me just jump in... "squirrel!" If Skyrim VR allows the use of graphics mods, it could be pretty damn awesome. But then, it would require something like the Vive Pro and a ridiculously spec'd system to back it up (like dual Vegas or 1080s). Given the state of the graphics card market right now, I'm not quite ready. I do plan on building a disgustingly pimped out AMD system (gimme that Threadripper!) in honor of my Dad and the games we used to play, but that can wait... I'll be spending enough just getting the case airbrushed (as soon as I can find someone to do it). I just went ahead and pre-ordered the Gold Edition of Far Cry 5 - I was going to settle for the regular edition, but playing on Mars sounded really cool. I hope they get the gravity right. I'm currently working through Uncharted Lost Legacy. Is it just me, or does Chloe Frazer's face look pretty much identical to her voice actress', Claudia Black? I can't tell if I'm losing my mind or not on that. Also thinking about maybe picking up Surviving Mars. Anyone checked that one out yet? I've been watching a Let's Play on it, and it looks sort of zen, like Stardew Valley. But the difference being if you screw up, lots of people don't die in Stardew Valley. agree with yalls opinions about fc4, 3 and primal for sure. I thought id HATE primal but it just sucked me in(*although the only fc game i havent beaten but only because other games got my.....SQUIRREL!~..) and was a great addition to the series. stardew valley, whilst i lost a bit of intrest*(again not the game, me is the problem) loved it while i played it and need to get back to it eventually. Uninstalled. Ain't nobody got time for that. Installed, then uninstalled. Just wasn't feeling the dungeon crawler vibe... I guess I prefer Diablo 3 for that itch. This game is a blast. After 29 years of independant game devlopment, I released TwoDee X3, my two-dimensional, 3D RPG-Dungeon Crawler on mBox One, Playsystem 4, and PC. On a budget of $4.2 million, my team created a smash hit that finally reached #1 on the sales charts, raking in $126 million. The followup MMO, TwoDeeMMO, wasn't nearly as popular, but MMO's are weird like that. But with $374 Million in the bank, who know's what I'll release next! My first smash hit... I don't even like sports games! A turn-based, 4X style space game with JRPG style battles... sweet! Lotta fun, easy to pick up and put down. This one's weirdly interesting. You basically play a third-party Big Brother, investigating some terrorist activity online. You find clues that link characters to said activity, and send that information to the government for processing. This leads to arrests and interrogations, which can then lead to more information and research. It's a great concept, but the game feels like it's trying to hard to portray the "Big Brother" vibe in a negative light. It makes the game feel more like a "visual novel" approach than a game with branching storylines. It's "ARK meets Minecraft" more than it already was... it's fun, but the single-player aspect doesn't feel as complete or fulfilling as I'm sure the multiplayer version does. I'm more inclined at this point to re-install the origninal ARK and give it another go. An interesting take on the shopkeeper genre... you enter dungeons and collect items in a Tetris-style interface and sell them in your shop, which you maintain and upgrade. It's pretty ok for a small casual game, but I've only played it a couple of times. PixARK looks really interesting. I've never heard of it. Let me know how well it continues to develop, I might pick it up after it leaves early access. Crusader Kings II was free a few weeks back, so I picked it up and have been knee deep in that lately. I haven't actually played the vanilla game yet, but have been focused on the After the End mod and the A Game of Thrones mod. Finished Doom (the 2016 version) last month and played multiplayer for the achievements which is something I usually don't care for. Enjoyable game, although I think some people gush too much about it. I'm more of a Serious Sam fan when it comes to "enter room, kill everything before you can leave" gameplay because the levels tend to be more open. 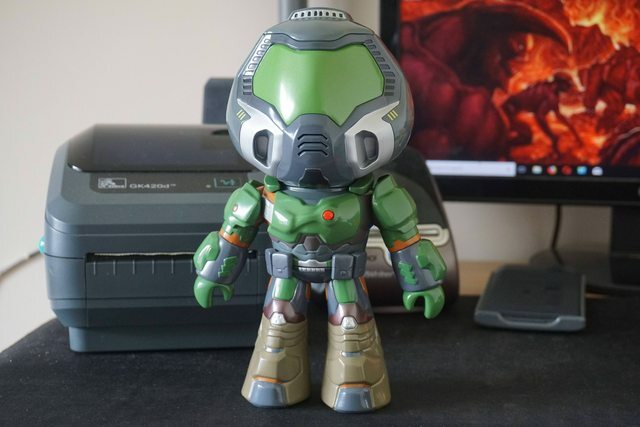 You can get Doomguy collectables during the game and only now have they started to sell them physically. I found them strangely adorable and had to get one which arrived today. Here is a video if you want to learn more. I really loved Doom 2016. I don't think I've ever seen a more optimized 3D engine in my life. I thought Hollow Knight looked great, but I'm not much of a platform gamer. Might have to check it out on sale this summer. About to load up Pillars of Eternity II: Deadfire for the first time. I'm going to do the same tomorrow. Really looking forward to it. Since I never played the original PoE, I was going to buy it (it was on sale @ various outlets) so I could play through it first. Then I realized it was already in my Steam library... likely added in one of the many Humble Bundles I've binged on. I still ended up going back to humblebundle.com and grabbing the WM DLC Pass for half off so I could get the whole experience. See, there IS an advantage to procrastinating! So far it's a pretty good game... but I find myself looking for those Eschalon style area flavor texts. It just feels weird walking to/through an area and not getting any flavor text popping up. Having to click on magnifying glasses to get some is a little immersion breaking, IMO. There are a few "storybook" sections that add some flavor. There's a bit more of that in the parts of PoE II that I've gotten through (not as much time to play as I might like with this whole life thing going on). DO NOT!!! start playing it, it is highly addictive - I am frequently neglecting my family and duties because of it. It's like Diablo but way better. P.S. If you start playing it, despite my warnings, Defiler is the best class (demolitionist + necromancer).